Elliebelly Knit & Dye Works > Blog > Knitting > Cast on All the Things! Cast on All the Things! Sometimes that mood hits! The perfect new pattern comes along. Or an irresistible yarn. That happened to me this week — times two. Both the perfect pattern and the perfect yarn came along. So despite an impressive array of works in progress, I'm swatching for two new sweaters. First up is Isabell Kraemer's Criss Cross Sweater. This one went into my favorites as soon as I saw it. But when I swatched with Plucky Scholar for a vest (it wasn't going to happen, the miles of twisted rib would have killed me) and realized my gauge was spot on for Criss Cross, I knew it was meant to be. I'm in love with this Bohemian Blue colorway, and the minute I opened the yarn two days ago, I knew it had to be knit with right away. 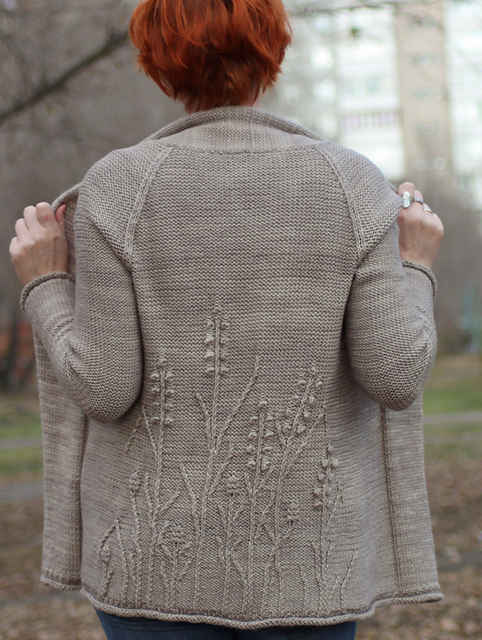 Then there was Katya Gorbacheva's Winter Weed's sweater pattern. Its difficulty level is clearly over my head, but how could I resist? The pattern is written for Plucky Primo Aran, and although I don't have a sweater quantity on hand, I have been hoarding the December Classics Heartstring's colorway on snug worsted. I didn't get gauge on my first try. But I'm not horribly far off — only 1.75 stitches over four inches, so I'm going to go up a needle size and see what I can do. I love this colorway and think it will be perfect for this sweater. The verdict is still out on whether I have the skills to knit it, but I have good knitting friends to rely on in a pinch. So it looks like I'll be casting on all the things in the next week or so. I've also got a couple of projects I want to swatch for ahead of the start of the Malabrigo March KAL. I expect to be doing a lot of prep and set up work for the sweaters as well as for Mal March, so there won't be a whole lot of knitting progress this week, but I do love having a number of projects in the works, which makes it easy to pick one up to carry around or travel with. These both look incredibly wonderful; I can see why you want to make them.